Vegetable farmers have vivid memories of the disaster that was the fall 2017 vegetable growing season, with Biblical proportions of whiteflies and nearly 100% virus infection. 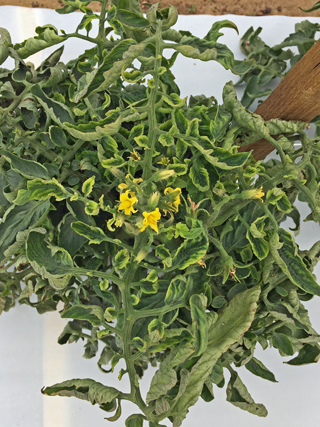 Cucurbit and tomato producers saw catastrophic losses to Cucurbit Leaf Crumple (CLC) (Figure 1) and Tomato Yellow Leaf Curl (TYLC) (Figure 2), respectively, and both groups invested tremendous resources attempting to control whiteflies that often infested crops within minutes of transplanting. The 2017 growing season built on problems that started during the fall of 2016. Many agree that the mild winter allowed whiteflies to overwinter in our area on alternative hosts that would have normally been killed by freeze events. We were fortunate in our area to have 18 freeze events between December 15, 2017 and February 15, 2018. Eight of these events were below 25°F (FAWN data from the Quincy station). This brings us to June 2018. Researchers have set up whitefly traps in North Florida, and South Georgia, but none have been caught in recent weeks. There were two weeks in April when whiteflies were found in tomato fields, but none have been reported since. It appears that whitefly populations did not overwinter in our area in significant numbers. If it sounds like I’m being cagey with my wording it’s because I am. With populations like we saw last year I’m exceptionally hesitant to say we’re out of the woods yet, but it appears whitefly populations are on track for a normal year. And by normal I mean that our populations will ramp up to numbers that need to be managed by October, hopefully near the end of most crops. I personally believe that it will be sooner than that, and I expect they will need to be managed in September, again just an educated guess. But don’t stop reading the article just yet. As of June 5, 2018 there have been multiple positive tests for Cucurbit Leaf Crumple (CLC) in watermelon in the area, and at least one positive test for Tomato Yellow Leaf Curl (TYLC), despite few whitefly numbers being found in the spring growing season. For tomato producers I still have tremendous concerns about TYLC infestation in fall crops and serious yield loss that could be sustained. The reason I concentrate on TYLCV is that we have resistant, not immune, varieties to combat this disease. During fall 2016 TYLC incidence increased later in the season, but still caused significant yield depression. In fall 2017, whitefly pressure was extreme during most of the season and varieties not resistant to TYLCV had 100% infection by the second tie. See the results of the Fall 2016 NFREC tomato variety trial and the Fall 2017 NFREC tomato variety trial conducted in Quincy to see the full comparison of varieties. Additional information on resistant varieties can be found in the tomato production chapter of the Vegetable Production Handbook of Florida. Resistant varieties are available that will protect producers against losses from TYLCV and I recommend using these resistant varieties for fall 2018 production. In my opinion the risk of loss from TYLCV outweighs unfamiliarity with producing resistant varieties. Even if resistant varieties are used it is still critical to manage whiteflies because feeding can result in irregular ripening in tomato. Cucurbit producers unfortunately don’t have as many options for managing whitefly transmitted viruses because there are no commercially available squash, cucumber, cantaloupe, or watermelon varieties with resistant to CLC. Because of this I think that fall cucurbit production, especially late season crops could be quite risky this year. 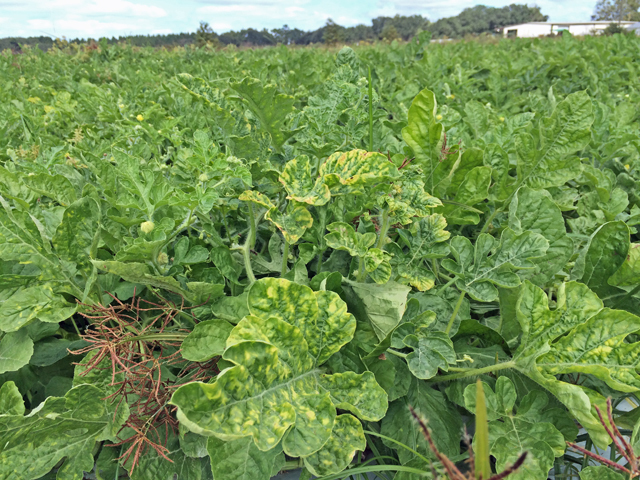 Regardless of whether it’s a cucurbit or tomato crop this fall, it is recommended that producers take all the usual steps to manage whiteflies. These management tactics can be found in the following publications. If you find whiteflies or suspected virus in your spring or early fall crops please notify your local extension agent because we would like to keep track of these for future reference. Dr. Freeman’s program focuses on vegetable and melon cropping systems important to the state and region.Much of his research and extension efforts are focused in the area of soil fumigants and fumigant alternatives for soil-borne pest and weed management.Many of the vegetable crops in Florida are produced using the plasticulture production system.For decades growers have relied on the soil fumigant methyl bromide for pest management.This chemistry is no longer available and Dr. Freeman’s program is addressing this issue.